A healthy diet doesn’t have to stop just because you’re in the air. We understand that with more people opting for the healthier alternative, catering services need to adapt and appeal to the shifting demand – and that is no different for us. That is why today, we’re shining a light on our smoothies which are growing to become an important addition to many inflight menus. Made with fresh ingredients, our smoothies are more than just a refreshing treat to brighten up a long flight. The recipes have been carefully crafted and tested by our chefs to ensure that each glass tastes delicious and is filled to the brim with essential vitamins and fibres. The colorful blends are a delicious addition to the assortment of beverages available, and we’re proud to say that our smoothies have been becoming a more popular menu item in Premium Economy, Business and First Class. Our recipes are made to suit an airline’s menu, whether it has a regional, ethnic or other focus. And though we cater to the tastes and preferences of the airline’s passengers, the drinks all share one important thing in common – their refreshingly good taste. 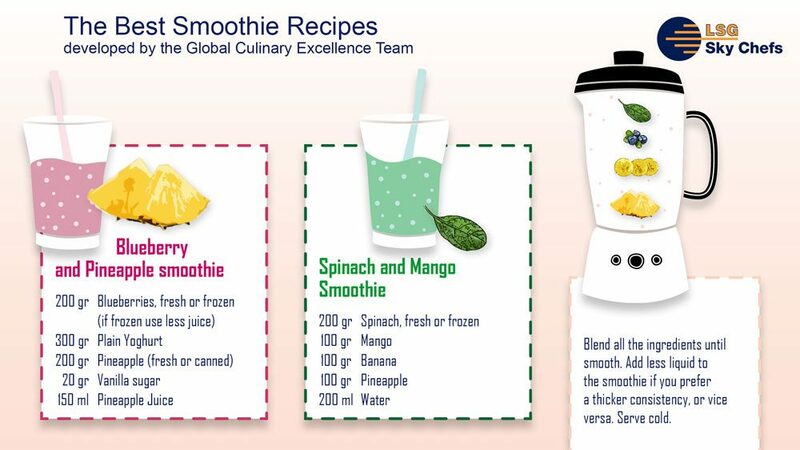 To bring some healthy goodness straight to you, whether up in the air or not, our chefs have worked on a few smoothie recipes that can be prepared at home. 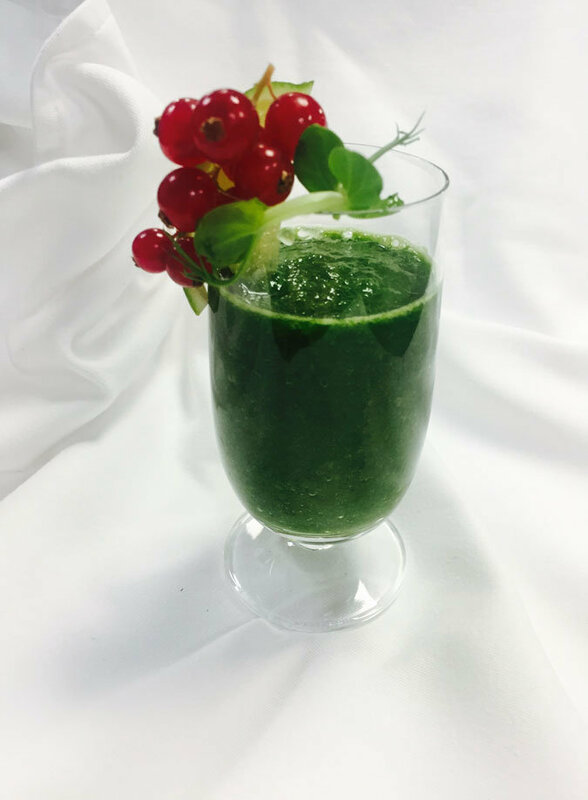 Inspired by the vineyards of the Napa Valley, the first smoothie is a baby kale smoothie that uses apples and pomegranate juice for a tangier drink that will energise you. Our spinach mango smoothie that was inspired by the tastes of India. If you’re a fan of tropical drinks, then the Brazilian-themed guaraná, aҫaí and banana smoothie might be the ideal choice. The bananas ensure you get your potassium, while the aҫaí pulp and guaraná syrup will bring you vitamins and energy . 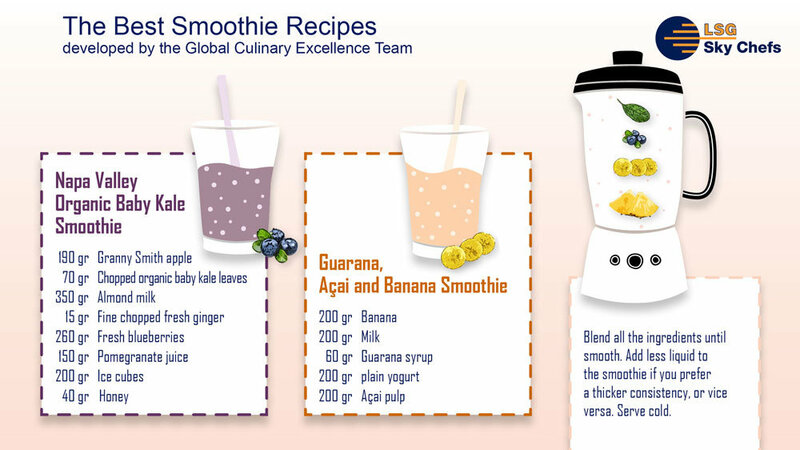 Now flying across the South Atlantic Ocean, our chefs bring to you the blueberry and pineapple smoothie. Made with blueberries, pineapple juice and yoghurt, the creamy drink hints at the abundance of fruits South African cuisine has to offer. Finally, for those who love a green drink, we have the perfect recipe: Our spinach and mango smoothie. Don’t be scared by the vibrant green color because the mangoes and pineapples balance the taste perfectly. Crafted with Indian tastes in mind, the drink is as yummy as it is healthy. And slightly addictive, if you ask us!